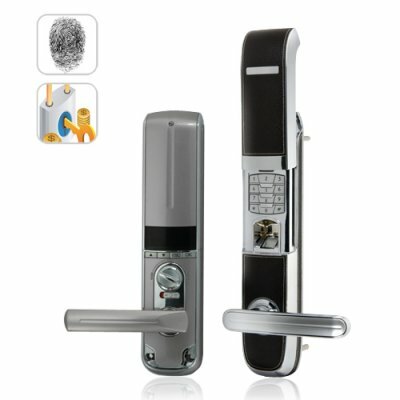 Successfully Added Protector - Heavy Duty Fingerprint Door Lock (Right) to your Shopping Cart. The Protector, our newest Fingerprint Door Lock. A heavy gauge, all-metal door entry protection biometric door lock for use when you require the highest level door security system at your company, university or government office building. If you want presidential level protection and won't settle for anything else, look to the "The Protector" Fingerprint Door Lock. Robust and Capable: This biometric fingerprint door lock and entry system was thoughtfully designed to handle the most sensitive and high security zones. The Protector can handle can be used to guard private banking offices, VIP rooms, and high classified laboratories among other things. If someone was not meant to have access to a building or room, then this heavy duty fingerprint door lock will make sure it stays that way. Indestructible: Fireproof, weatherproof and vandalproof, The Protector is made of only the best components along with a high grade die-cast aluminum casing that makes sure it can withstand even the most determined bad guys. Everything that comes with The Protector is of the highest quality, so you can be sure that from the lock set to the strike plate, you're getting a product that would cost 2x as much from others. In fact, burglars may find it easier to break through the wall than try to get through a door that has The Protector installed! Modern Technology: Mortice dead lock with dual latch bolts means heavy duty, high level security. Throw in a fingerprint scan or access code requirement and you have the most impregnable entry system available today. This fingerprint door lock is impossible to break into, but for those who have clearance, access is easy and only takes a few seconds. For total security, convenience and dependability for a lifetime, The Protector Heavy Duty Fingerprint Door Lock is an investment that will pay for itself the instant you install it. You can't go wrong with our low factory-direct price and express shipping. Order yours today and we'll ship it out to you tomorrow. We suggest you register 2 different fingers on each hand to avoid this problem, or open the door by password or key. No, but it is weatherproof, meaning any moist build up from fog or frost should be fine. It is not advised to install the CVPW-J28 in unsheltered areas where direct contact with rain, hail, or snow is likely.